This recipe would work great with any white fish such as cod, halibut, tilapia, etc. You could even use a chicken breast and double the bake time. A great substitute for the pasta would be white or even brown rice! I used cod in the picture. Start boiling a small pot of water for the pasta. Make sure to add salt to the water. Spray a baking dish or baking sheet with non-stick spray. Sprinkle the fish with salt and pepper on one side and place it on the baking sheet (salt/pepper side down). On the other side sprinkle it with salt, pepper, and thyme. Then spread the Dijon mustard on top (this is going to work like "glue" for the almonds.) Top with the chopped almonds. Wait for your pasta water to start boiling, then put the fish in the oven and bake for 8-10 minutes. Then add the pasta to the water, it will take 8-10 minutes also. While the fish and pasta are cooking, heat up a small pan on medium heat. With about 5 minutes left on the timer to cook the fish/pasta, add the oil and garlic and saute for 1 minute. Add the spinach and saute for 3 minutes until wilted and cooked down. Don't forget to sprinkle a bit of salt and pepper in it! Take the pan off the heat. Strain the pasta, and add it straight to the sauteed spinach. 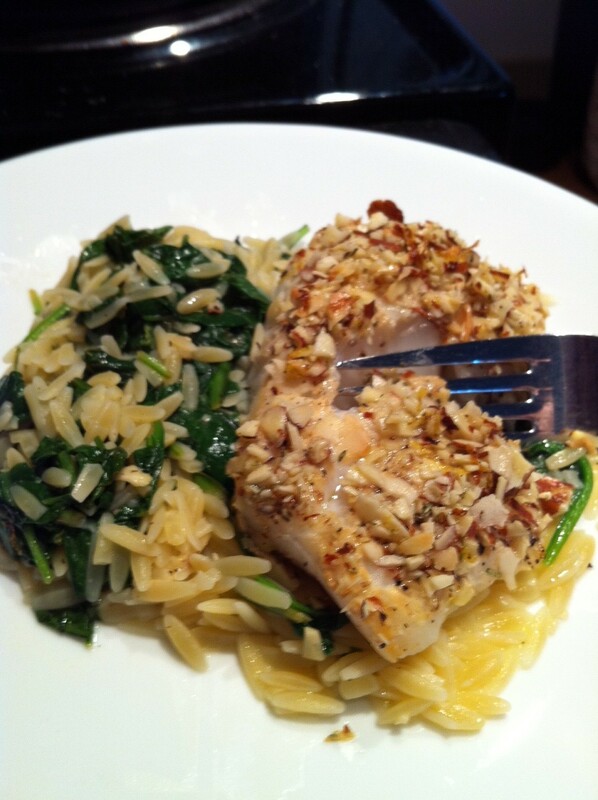 Squeeze one of the lemon wedges into the spinach and pasta. And use the other wedge for the fish.